About this time of year I start getting a feeling inside that fall is about to arrive. This is proof that you shouldn't often trust feelings because since I live in Tucson, summer will stick around to mock us for at least another month, probably longer. But, a girl can pretend. My favorite way to pretend fall is in the air is to cook up tasty pumpkin treats for my family. Muffins, cookies, fancy desserts, and pancakes regularly make appearances in my kitchen starting this time of year through about February or March. Oh, who am I kidding? I make pumpkin muffins/bread year-round. 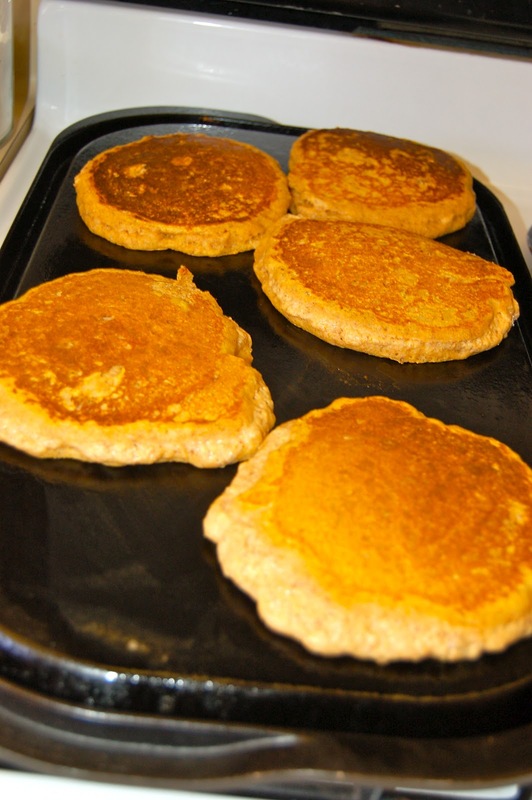 I'm sure many of you eat pumpkin pancakes. I'm also sure many of you want to eat pumpkin pancakes. So let me do the google work for you. After experimenting with several recipes, this one rose to the top as my family's favorite. I always double it for three reasons. First, my kids eat a lot. Second, a double recipe gives us enough for breakfast the next morning. Pop them in the toaster and ta-daaa! Third, I prefer to use a whole can of pumpkin rather than just one cup. Often I would end up throwing away whatever was left in the can because it would spoil and I hate throwing food away. Mix all dry ingredients in a large bowl. 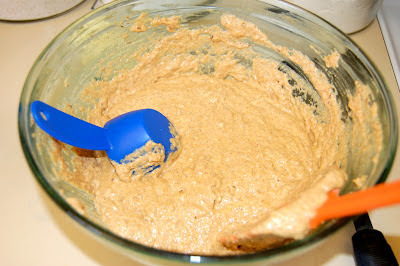 Mix wet ingredients then add it to the dry mixture. Then griddle them up! I love the color of pumpkin batter. Wow! Look at those cakes of awesomeness. While your at it, you should just go ahead and make your own syrup. Why pour carmel color, high fructose corn syrup, or preservatives all over your homemade goodness? It is so easy to make. One cup of sugar to 1/2 cup of water makes enough for my family. 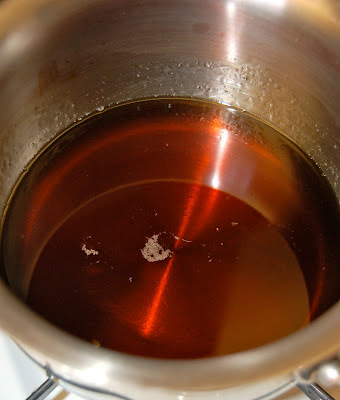 I cook it until it bubbles clear and then add a a teaspoon of maple flavor. If you don't want to make syrup at least splurge and buy real maple syrup. A giant stack of fall on a plate. That's right. Even though there are a ton of pancakes. It is only two breakfasts worth for all my little piggies. I like mine topped with chopped pecans. Oh my goodness. Fall in my mouth. If you are going to pretend you might as well pretend with food! Happy autumn to you! What is your favorite part of fall? Do you do anything special to pretend it is almost here? 5 important comments so far. What are your thoughts? Thanks for doing the research work for us, I hate when pumkiny things don't turn out because of a crappy google recipe. I'm excited to try these (and any other fall recipes you'd like to post)! My favorite part of fall is going on more walks. Look at you and your foodie pics, love it!! I am SO in the mood for fall, and pumpkin everything! Love it! I need to try that recipe! I start wearing my darker falls colors and try to sneak by with a scarf and boots here and there. And once the PSL comes out at Starbucks, I'm there!